Remember Warm Tootsies? I finished the second of them a few weeks ago and the resulting pair did more than just hone my knitting techniques. It taught me a couple of hard lessons. I bought the yarn for these several months prior, 2 skeins. One per sock. That is nothing new, of course, every knitter has a yarn stash – both of new skeins and remnants from other projects. But before finishing my first sock I ran out of yarn, just as I was getting to the toe. No big deal. The toe makes for a practical and typical transition point to use another color, so I completed it with yarn from the second skein. Now, if I was doing my math correctly, each sock took just over 1 skein so 2 skeins would not be enough to finish both socks. And following that logic, since I had already taken some yarn from the second to finish the first, that would leave me with even less before I ran out on the second. Are you following me so far? So back to the store I went. Yes, I know – one of the Big Box craft stores. I have nothing against supporting local talent and small business. But sometimes price and/or convenience outweighs the others. And since the first 2 skeins was purchased there – there is where I went! I knew they wouldn’t have the same dye lot. I had taken the last couple of skeins with my original purchase. And not being a recent purchase I knew even if they had had more stock in back it would not be likely. So back home I went with a 3rd skein. Now following my above logic, if I continued with the 2nd skein I would run out sooner and in a place NOT practical and typical somewhere mid foot. So I started cast the second sock on with the 3rd skein. You can probably see where I am going with this. Sure enough as the striping emerged the first thing I noticed is that the individual strands in the plies were not as subtle. Rather than moving from one color into the next there was a deeper color, creating a deeper shading, mixed throughout. There was also a noted absence of colors. 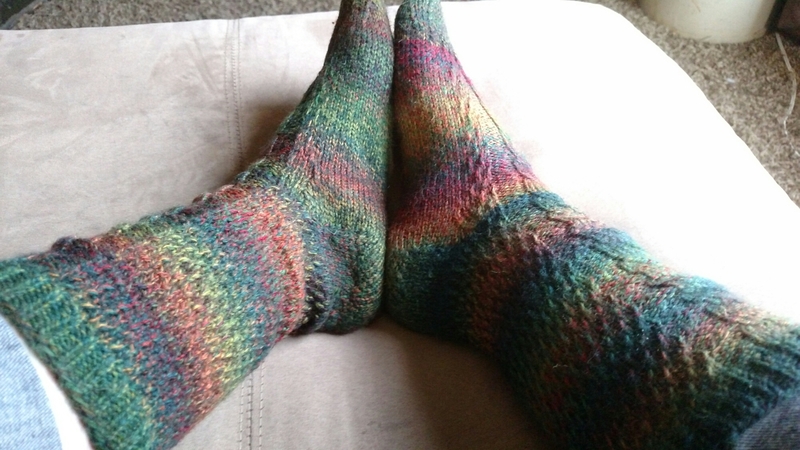 The golds and fuchsias from the first sock were completely absent and replaced very sparsely with a bit of raspberry. I continued to knit because a) these were for me anyway – not a gift for anyone else and b) for the most part I would be the only one that would see them. They’d be hidden in shoes unless I was home and c) perhaps if I went a bit further the colors that were missing would start to emerge. But, sadly, all of the beautiful tones from the first sock that had me so excited, that played so nicely with the pattern, were completely absent. I have certainly always been warned to purchase enough within the same dye lot to finish a project. That there could be slight changes, noticeable especially in solids. But I never would have thought that the changes could be that significant, especially because they weren’t solids. A slight color change in one of the strands should not have thrown off the entire color scheme. It should not resulted in the complete omission of certain colors. Sadly disappointing to say the least. I certainly doesn’t stop me from wearing them. Mix-matched socks are still just as warm. But you can bet I’ll keep a closer eye on dye lots going forward. The the story is not over! Because as I approached the toe there was a noticeably sizable amount of yarn left. Quite enough to finish it in fact, with room to spare. 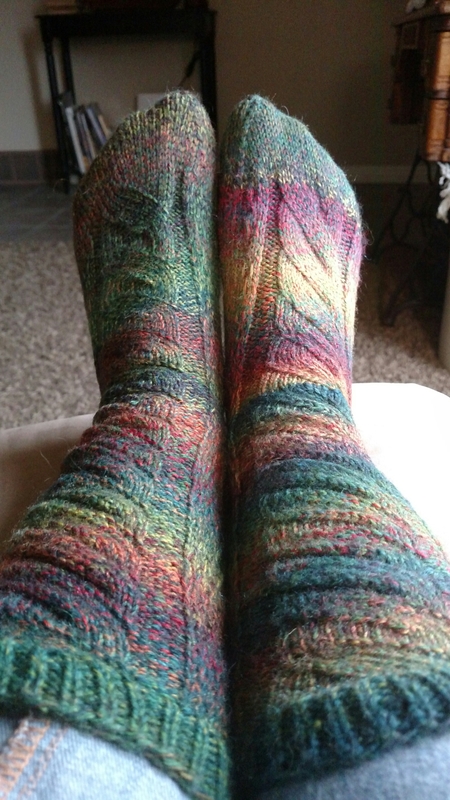 Why did I run out so quickly, then, on the first sock? My gauge could not have changed that much. The only conclusion I could come to is that the skein I started with had been partly used and then returned to the store! I should have had enough to finish the first sock after all, had I not been the victim of some other persons scheming to save a couple of bucks. Has this happened to anyone else before? Should I perhaps start weighing my skeins to make sure there is nothing missing from them? Admittedly I will, in all likelihood, continue to buy yarn from places such as this. But I will do it with the understanding that it is a calculated risk. Has anyone else had a Dye Lot Disaster?